The Gurney family have been associated with Cumbria since 1906 when land agent, surveyor and entrepreneur James Gurney, who loved the Lake District, bought Ireby Grange Estate in 1906, which has remained under family ownership ever since. The Gurney Charitable Trust was set up in 1990, originally making grants to smaller charities in Buckinghamshire. The Trustees, who are all members of the Gurney family, then set up endowments with local Community Foundations in Sussex, Buckinghamshire and more recently Cumbria. The grants from the endowments are assessed by each Community Foundation to make sure that the donations give the best expected benefit to the local community. The grants address a range of charitable causes including health and medical issues, disability and disadvantage, natural history and the arts, and wildlife and conservation. Keswick Museum and Art Gallery received a grant towards a creative project that celebrates the many inspiring and unsung women of Cumbria and marks the centenary of the first UK votes for women. 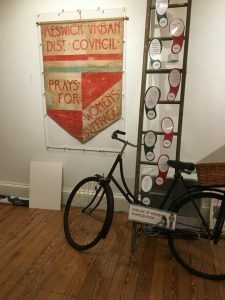 The Celebrating Women of Cumbria project involves 11 museums, who have worked with a local artist and groups of women and girls to each create a banner, reflecting their heritage and views of today. The banners are a nod to history and specifically the National Union of Women’s Suffrage Societies march from Carlisle to London which started on 18th June 1913 and had amassed the support of 50,000 women by the time it arrived in the capital on 26th July 1913. The banners will be paraded in Carlisle on Saturday 3rd March 2018, to celebrate International Women’s Day, and then on display at their respective museums throughout 2018.